Very clever Television ad that mixes an odd mix of talent together to sing a message about a product that could use something to talk about. After numerous delays and development hiccups, RIM has finally unveiled it’s next generation BlackBerrys on Wednesday, a new lineup of smartphones that could make or break the company. The company also dropped its Research in Motion moniker in favor of the BlackBerry brand. Heins showed off two new phones at simultaneous events across cities around the world including New York, Toronto, London, Paris, Johannesburg, Jakarta and Dubai. The Z10 resembles the smartphones most of us have become accustomed to since the dawn of the iPhone with a large 4.2-inch screen while the Q10 maintains the company’s iconic physical keyboard, an addition that will surely appeal to the BlackBerry faithful. Both run the company’s next generation operating system, BlackBerry 10. U.S. carriers will announce pre-registration today. Although there are no concrete release dates, the new phones are expected to ship in mid-March. The Z10 is expected to cost $199 with a contract and will be available on Verizon, AT&T, T-Mobile and Sprint. The LTE-ready Z10 comes outfitted with a 4.2-inch 1,280 x 768 display and measures in at 5.13 x 2.6 x 0.37 inches, making it slightly thicker than the iPhone 5 and Samsung’s flagship Galaxy S III. Powering the 138 gram phone is a 1.5GHz dual-core Snapdragon S4 Plus with 2GB RAM. On stage, Heins demonstrated a slew of innovative features unique to the new platform, including a virtual keyboard that allows you to flick words onto the screen, multi-tasking integration called BlackBerry Flow and a robust re-envisioning of the Blackberry Messenger experience. Of emphasis was “BlackBerry Balance,” the platform’s ability to seamlessly merge both work and play in a single unified experience. For corporate users, it could mean finally ditching the practice of carrying around two phones. But in the age of “ecosystems,” simply having a solid phone with great software is no longer enough. Users expect more. They want their favorite apps and easy access to all the digital entertainment — games, music, videos, books, sports — that they’ve all grown accustomed to. On this front, BlackBerry didn’t disappoint. The new BlackBerry World is the company’s answer to the iTunes Store and Google Play and already includes over 70,000 apps and support from eight movie studios and all major music labels. BlackBerry 10 launches with support for Facebook, LinkedIn, Foursquare, the NHL, Major League Baseball and more. Skype, Angry Birds and WhatsApp among others have all pledged their support for the platform although there were some notable absences. Instagram was nowhere to be seen. Whether or not the new releases can put up a serious challenge against Apple and Android remains to be seen. In the months leading up to the launch, BlackBerry’s stock has soared. But mere days before the launch, analysts were split over whether the new phones could save the company. Following the announcement, BlackBerry’s stock was down over 6 percent. Others, however, believe this could be an opportunity for a serious comeback. For BlackBerry, the realization that this could be the company’s last chance saloon has culminated in an unprecedented marketing push. Heins revealed that singer-songwriter Alicia Keys would be the company’s new Global Creative Director. And next week, the new BlackBerry will be featured in its first ever Super Bowl ad. As a key part of this strategic realignment, DDMG has begun the cessation of its Port St. Lucie operations by reducing virtually its entire Port St. Lucie workforce, retaining approximately 20 employees who will remain as part of the wind-down. And so it begins: Facebook CTO and platform guru Bret Taylor is leaving Facebook this summer, off to do a startup with Google App Engine founder Kevin Gibbs. Taylor confirmed the news in (of course) a Facebook update. This is one of the first in a wave of Facebook departures we’re hearing, as a slew of older employees have hit their four year stock cliffs, and the 90 day IPO lockout fast approaches. According to a source, many Facebook employees including one other executive are already planning what to do next. It makes sense. With the stock price low, additional RSUs granted to keep people sticking around won’t be nearly as good a retention mechanism. I’ve also been hearing separately that due to the IPO fallout, Facebook is currently under a modified hiring freeze, with groups that were previously allotted slots for senior-level positions having had those slots reneged. Lower level deals and hires are still happening from what I’m hearing. So is this a harbinger of a hiring sea change? Facebook has had a monopoly on the best and brightest engineering talent for the past couple of years and it’ll shake the Valley to its core if this is indeed the case. Well, if the founder life isn’t for you future Facebook refugee, we hear Pinterest is hiring. Amazon may have just gotten its claws into Kiva Systems, but there’s more than one company out there looking to automate warehouses with smart little robots. 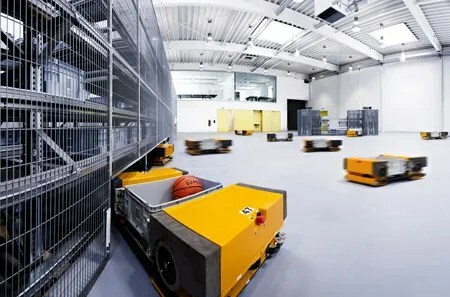 At the Fraunhofer Institute for Material Flow and Logistics, researchers are looking for ways to make warehouse robots smarter and more efficient by getting them to communicate and cooperate like a swarm of ants. A swarm is just exactly what you want with warehouse robots. There are a lot of them, and they’re all identical and interchangeable, cooperating to complete complex tasks by combining simple actions. The big difference between a swarm of (say) ants and a swarm of (say) robots is that the ants don’t have any high-level control: each ant has its own little tiny brain, and even though ants have specific tasks that they are directed (or bred) to perform, they decide on an individual level how to go about carrying out their instructions. What Fraunhofer is trying to do is mimic the ant swarm system with robots. For example, instead of having one central computer control the movements every robot (as with Kiva), Fraunhofer’s system utilizes robots that make their own decisions with onboard computers. Each robot communicates with all the other robots in the swarm simultaneously using WLAN, and they use algorithms based on a model for how ants forage for food to cooperatively decide which of them should go where and do what. The robots don’t need fixed localization points, but instead rely on “integrated localization and navigation technology” (including signal-based location capability, distance and acceleration sensors and laser scanners) to find the most direct routes to their destination without crashing into anything or each other. This makes them very efficient, and it also makes the system easily scalable, since you can introduce new things and the robots won’t freak out. Scalability, reliability, and flexibility are why swarm robotics has been getting so much attention lately: need a bigger system? Just toss more bots into the mix. Lose a bot to a mechanical problem? It’s not a problem, since another bot just takes over. We’ve seen lots of swarms related to search and rescue (i.e. military) applications, but as far as a way to improve a commercial (or industrial) project, this research seems like a promising way to go.